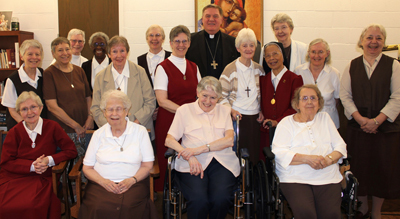 Sisters in Beacon, N.Y., celebrate with Cardinal Joseph W. Tobin on August 9. It’s been over four years since we moved to Beacon, New York, to live with the Discalced Carmelites in the Monastery of the Incarnation. It has been a blessing and a challenge. The Carmelites welcomed us with open arms and hearts. Our friendship with this community was planted when we both were founding members of the Metropolitan Association of Contemplative Communities. Our roots deepened over the years as we participated in innumerable ongoing formation meetings tailored to our contemplative lives. Who could have predicted that 50 years later we would be sharing a monastery? Together Redemptoristine Nuns and Carmelites share in mutual charity an affinity and compatibility found in our traditions of prayer, work, and leisure for the benefit and enrichment of our communities and the salvation of the world. It is a blessing to be able to continue our Redemptoristine life of prayer as a living memory of Jesus among our Carmelite Sisters. 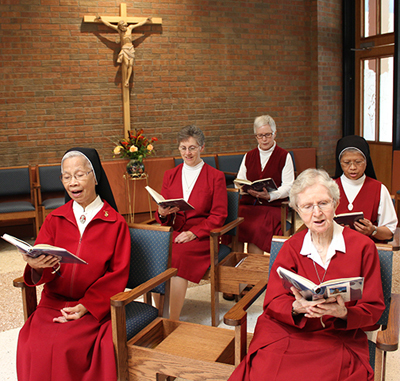 The Red Nuns pray and dine with the Brown Nuns, share in planning the liturgies for Mass and Office, join in household tasks, even have 10-day retreats at the same time, though each community has its own director. Redemptoristines pray in their chapel. When we have our own community meetings, recreation, or special Redemptoristine devotions, we gather in Celeste Hall. Occasionally we have joint meetings to discuss various needs of the monastery and to plan for solemnities. 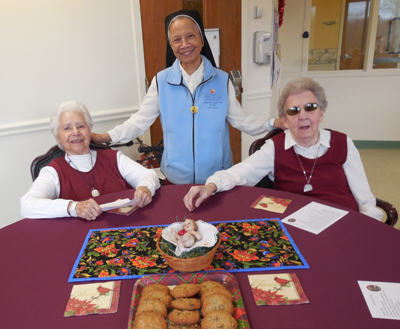 It is a challenge living in a monastery not our own, but the reality is, we couldn’t make it on our own now with our few numbers, aging issues, and two sisters at Lourdes Health Care Center in Wilton, Conn. Yet we still live our Redemptoristine life, trusting in the message of Blessed Maria Celeste of God’s plan that the entire world know and experience God’s boundless love, mercy, and redemption. These past four years have been full of celebrations and gatherings of Redemptoristines from around the world. We’ve gone to our other monasteries to help or to discuss upcoming directives from the Apostolic Constitution “Seeking the Face of God” on women’s contemplative life; we’ve prayed and grieved with our sisters who have lost beloved members. The most important event was the beatification of Maria Celeste Crostarosa in Foggia, Italy, last year. Recently we inaugurated a new website: http://rednunsny.org/. We are also active on Facebook. Though we are currently on hiatus from making Redemptorist habits, we will be up and running again come the New Year. Sisters celebrate the feast day of Our Lady of Lourdes. On the second and fourth Thursday of each month Fathers Tom Travers and Tom Deely take turns celebrating Mass at the Monastery of the Incarnation. Though we’re off the beaten path in Beacon, we are always grateful and blessed when other Redemptorists stop by to celebrate the Eucharist and a meal and to share news. Connection with our brothers is a real value to us where we can rejoice together in all the good things the Lord has done for us. Daily we pray for their work among the most abandoned and in spreading the Good News of plentiful redemption. On the Feast of the Immaculate Conception we will celebrate 60 years in the Hudson Valley. It has been a joy and privilege to hold our brother Redemptorists and Redemptoristine sisters in every corner of the world—and all the people of God—up to the heart of our Holy Redeemer.